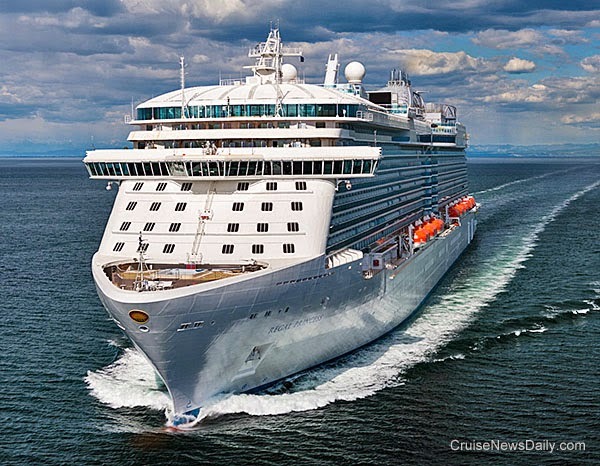 Last week, Royal Caribbean surprised the industry by announcing that after one winter season sailing from the Northeast United States to the Caribbean, the company would move Quantum of the Seas to China. A lot of American cruisers were nonplused and had a hard time understanding the move. The subject of China was a major topic in Royal Caribbean’s conference call to discuss their first quarter earnings with financial analysts yesterday. The comments shed a lot more light on Royal Caribbean’s view of China, so it’s easy to understand why Quantum won’t be here and why more ships will probably follow it to China. There was also some interesting discussion about the Caribbean market, which should give consumers an idea of what to expect in that popular market, and there was also an interesting insight into why the company wants to upgrade the internet on their ships. Purchase was named ‘Young Entrepreneur of the Year’ in recognition of the huge success and phenomenal growth of the company he created cruisingexcursions.com. After school Purchase did a chemistry degree at Coventry University and then worked in the travel industry for a tour operator gaining valuable experience and where he identified the gap in the cruising industry. Cruisingexcursions.com is based in Cannock in the Midlands and employs thirty-nine people. The Hall of Fame Awards are a fixture in the travel industry’s calendar where the best in the industry are honoured. Simon Purchase was in illustrious company with easyjet’s CEO Carolyn McCall receiving the 2014 the Business Achievement Award and The Ambassador Award for Outstanding Contribution to Sustainable Travel presented to Jane Ashton, Group Director of Sustainable Development at TUI for her dedication to sustainable travel issues. The online shore excursions and activities company cruisingexcursions.com was launched in June 2011 with the aim of providing reliable, shore excursions at competitive prices. The varied choice of activities include walking tours, sightseeing, luxury beach days, cultural, historical, religious, fine cuisine or simply experiencing the culture and vibrancy of a region. The company now has a choice of close to 10,000 excursions at more than 700 ports worldwide. The company is based in Cannock, Staffordshire and is headed by MD Simon Purchase who in 2014 won the travel industry’s Hall of Fame Young Entrepreneur of the Year Award. When MSC Divina came to the Caribbean last fall, it was to be dedicated to the American market and sail in the Caribbean year round. It’s still dedicated to the American market, but after a year a half, it will leave the Caribbean for the summer (2015). It will be back for the winter 2015-2016 season, but why it’s going to the Med and not staying in the Caribbean makes sense, if you follow the reasoning all the way through. Carnival Cruise Lines said today they will homeport a third ship year round at Galveston beginning next February. It will be deployed primarily in the seven-night market. The additional ship will represent a 38% increase in capacity at the Texas port, because the additional ship will be the 110,000-ton Conquest-class Carnival Freedom. Seattle, Wash., April 24, 2014 — The Gastronomy Club Wien and the Chamber of Commerce in Austria presented Holland America Line’s Master Chef Rudi Sodamin with the “Golden Cloche” award. In cooperation with The Austrian Cooks’ Association, Gastronomy Club Wien honored Sodamin during the Gala Night of Gastronomy 2014 at the Orangery in Vienna. Gastronomy Club Wien is an esteemed organization in Vienna whose members are chefs and restaurants owners in the gastro industry. Past honorees include Heinz Reitbauer, a 3-star Michelin Chef from the Viennese restaurant Steirereck, and Chef of the Century Ekard Witzigman from the Gault Millau guide. Only three other chefs – Paul Bocuse, Joël Robuchon and Frédy Girardet — have been awarded this title. Chef Sodamin also learned that later this month he will receive the “Golden Medal of Honor” from the Austrian Province of Styria. The prestigious award will be presented to Sodamin, who was born in the region, by the Governor of Styria, Magister Franz Voves, in an official ceremony in the state rooms of the Parliament in Graz, Austria. Sodamin is internationally recognized as a food authority and one of the hospitality industry's most innovative chefs. 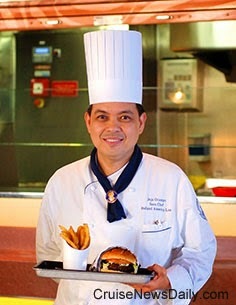 He has directed the evolution of fine dining and unique menu options at Holland America Line through his role as culinary consultant. His ideas have been instrumental in the development of Holland America Line’s interactive culinary arts program onboard as well. Sodamin is chairman of Holland America Line’s Culinary Council, which was formed to enrich the premium line’s culinary program and is composed of international chefs Mark Best, Jonnie Boer, David Burke, Elizabeth Falkner and Jacques Torres. Sodamin revolutionized the menus and perceptions of the most prestigious cruise lines in the world and is the author of numerous internationally published cookbooks, including “Seduction & Spice” (Rizzoli, 2000) and Holland America Line’s “A Taste of Excellence” (Rizzoli, 2007), “A Taste of Elegance” (Rizzoli, 2009) and “A Taste of Celebration” (Rizzoli, 2010). His many accolades include a rating of 17 (out of 20) and Three Toques from the prestigious Gault-Millau Guide, the first for an onboard restaurant (the only such award ever presented at sea). Sodamin belongs to the prestigious Academy Culinaire de France, the Maîtres Cuisiners de France and is an honorary member of the noble Club des Chefs des Chefs whose members cook for presidents, kings and prime ministers. MSC said MSC Divina will sail in the Mediterranean during the summer of 2015 instead of the Caribbean. The ship will return to the Caribbean for the winter 2015-2016 season. Carnival Cruise Lines announced this morning they have scheduled Carnival Freedom to sail from Galveston year round beginning in February 2015. This marks the first time a cruise line has homeported three ships to sail year round from the Texas port. Carnival Freedom's regular pattern of cruises will be three distinct seven-night itineraries. Norwegian Cruise Line today said they have scheduled Norwegian Epic to sail from Southampton twice n the fall of 2015. There will be one six-night cruise departing on September 20, 2015, that will call at Cartagena (Spain), Grenada and Lisbon before returning to Southampton on September 26. The second cruise will follow a 15-day dry dock in France and depart Southampton on October 11, 2015. It will be a seven night cruise calling at Vigo (Spain), Lisbon, Granada and Cartagena before ending in Barcelona on October 18. Norwegian Epic will then begin a new program of cruises from Barcelona, its new year round home port. Regal Princess successfully completed six days of sea trials in the Adriatic and returned to the Fincantieri yard in Monfalcone (Italy) on Monday. Princess says everything appears to be on track for an on-time delivery on May 15. Photos courtesy of Princess Cruises. All rights reserved. May not be copied or used without express permission. This is what most cruise passengers will never get to see. Mein Schiff 3 is under construction for TUI Cruises at the STX Finland yard in Turku, and the crew is testing the evacuation systems they would use in case they would be ordered to abandon ship. Yes, the video is in German, and no, there is no English translation available. It's not necessary to speak German to figure out what's going on, but if you do, you'll have an even better understanding. 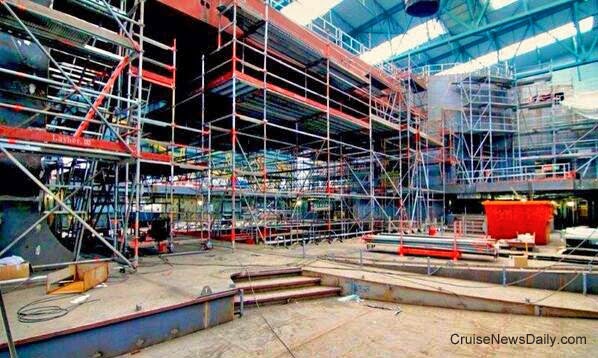 Construction of Royal Caribbean's Quantum of the Seas is continuing at Meyer Werft in Papenburg, Germany. In the top photo taken yesterday, you can see the main pool area. The ship is set to be delivered this fall, so in just a few months it will already be filled with passengers enjoying the Caribbean sun. The bottom photo, also taken yesterday, gives perspective of the size of the ship and the level of completion. Photos courtesy of Meyer Werft and Royal Caribbean International. All rights reserved. May not be copied or used without express permission. MIAMI – April 23, 2014 – Norwegian Cruise Line is elevating the cruise ship cocktail and enhancing guests’ travel experience with an exciting new destination-based handcrafted summer beverage program. The line announced today that they have partnered with James Beard Award-nominated mixologist Gabriel Orta of Miami-based Bar Lab Cocktails to create five seasonal beverage menus focusing on local ingredients that celebrate popular summer destinations including Bermuda, the Caribbean, Hawaii, Alaska and Europe. In line with the classic cocktail culture resurgence seen in today’s land-based bars and restaurants, the onboard regional menus each feature four specialty cocktails created with traditional spirits and flavors relevant to the ships’ itineraries. Recognized for their ingenious approach to the industry, the avant-garde cocktail programs created by Bar Lab have been awarded numerous professional honors and featured in publications worldwide. The summer menus designed by Bar Lab along with the Norwegian beverage development team feature avant-garde cocktails made with fresh juices, aromatic herbs and complementary local spirits. The new cocktails offer guests an advanced taste of the ship’s ports of call and further immerse them in the local culture. When sailing to Bermuda on Norwegian Breakaway or Norwegian Dawn, guests can enjoy a traditional Dark & Stormy, with Bermuda’s own Gosling’s Rum and ginger beer, or sample a new take on a Mai Tai, featuring house-made almond syrup, Gosling’s Rum and dusted with powdered cinnamon. Cruisers in the Caribbean sailing onboard Norwegian Getaway or Norwegian Sky can try a Spicy Pina Punch, with Bacardi Superior Rum and chipotle pineapple syrup, or a unique Island Colada, featuring coconut cream, peach puree and Bacardi Dark rum. 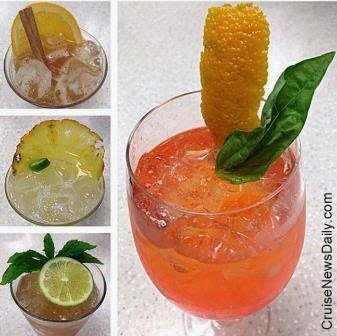 Distinct beverages on the Europe menu, which is served on Norwegian Epic, Norwegian Jade, Norwegian Spirit and Norwegian Star, highlight Aperol, Campari, Hennessey and Grand Marnier, while on Pride of America Hawaii cocktails include Whaler’s Dark rum and even Kona beer. Those guests experiencing an Alaskan cruise on Norwegian Pearl, Norwegian Jewel or Norwegian Sun can warm up after exploring a glacier with a Smoky Hot Toddy, combining crème de cacoa, orange peel, cloves, bitters and Grant’s scotch or a Northwest Java Jump with Patron XO Café, Chai tea and cream. Guests sailing with Norwegian this summer can enjoy these specialty cocktails from July 1 – September 15. Norwegian will debut new menus featuring holiday cocktails in early November. MIRAMAR, Fla., April 23, 2014 -- MTN Communications (MTN) announces Silversea Cruises, Ltd. (Silversea) is renewing and extending the companies' long-term relationship. Silversea chose to increase the breadth of communications services MTN will provide its eight-ship fleet, including its latest ships, Silver Discoverer and Silver Galapagos. This relationship includes a substantial increase in broadband connectivity to its ships. MTN also worked with Silversea to optimize the Wi-Fi design on each vessel with the latest technology to further enable Silversea support of video streaming and other guest services. These upgrades support expanded broadcast, data and voice services on the Silversea fleet, further catering to today's Bring-Your-Own-Device (BYOD) passengers and crew. "Silversea has been an MTN customer for nine years and is recognized as the world's top ultra-luxury cruise line," said Jason Cohn, director of global IT infrastructure, Silversea. "Committed to the highest standards of excellence, our itineraries cover all corners of the globe, so it is critical to deliver reliable communications and content everywhere at a level akin to a land-based resort. We are especially excited about the range of communications services on our two latest ships. Cruising these rarely-visited locales not only requires mission-critical connectivity, but a unique opportunity to show friends and family the highlights along such extraordinary journeys." Silversea's enhanced connectivity infrastructure is enabling existing and new MTN communications offerings. These range from enhanced Internet access to calling solutions to new broadcast capabilities. "We want Silversea passengers to have the most luxurious cruise experience available," said Brent Horwitz, senior vice president and general manager, cruise services, MTN. "Part of that has been the ease, convenience and choice associated with communications services from MTN. Like Silversea, MTN delivers a quality and reliable service. With customers anticipating the skyrocketing demand for land-like communications on passengers' and crews' own devices, MTN takes great pride in enabling new applications and myriad entertainment options, as well as business-critical tools, for the Silversea fleet." MTN operates a worldwide connectivity footprint and content suite through its hybrid satellite and broadband terrestrial network across the globe. The pioneer in broadband maritime communications, MTN prides itself on the innovation and value that it delivers to cruise industry partners. "MTN looks forward to continuing its partnership with Silversea," Horwitz said. "We share the same passion for a luxury experience at sea, including service excellence in communications. Only MTN has the technology and infrastructure that meets and exceeds the crew and passenger expectations found on such a top-line fleet. We appreciate the opportunity to expand the ways in which we serve this industry-leading organization." MTN is the leading global provider of communications and content services for maritime and remote locations. Since launching the first stabilized satellite antenna for ships at sea in the early 1980s, MTN has pioneered remote-connectivity technologies that become longstanding solutions. MTN serves most of the world's cruise lines, as well as hundreds of yachts, cargo ships, oil and gas vessels, ferries, and government aircraft, ships, vehicles and facilities. To meet today's at-sea and remote communications and IT needs, MTN's unmatched portfolio delivers Internet, voice, live global TV, mobile apps, multimedia content delivery, video conferencing, network management and bandwidth optimization. The company's communications ecosystem, MTN Nexus(TM), is advancing industry thinking "outside the bandwidth box" to minimize costs, maximize throughput and optimize operations. This end-to-end solution converges satellite and terrestrial broadband, cloud computing and application development to optimally deliver land-like speeds at sea. Along with high performance and high availability, customers turn to MTN because its comprehensive suite of services and flexible contract terms address widely varying mission-critical operational requirements - everywhere in the world. For more information, visit www.mtnsat.com. Most cruise fans know that the Love Boat was set aboard Pacific Princess, and they know it was one of the early ships of Princess Cruises. They also know that most of the time the Love Boat sailed from Los Angeles to Mexico. But Pacific Princess wasn’t Princess’ first ship. Another ship came before the Love Boat and made the Mexican Riviera Princess’ signature route. 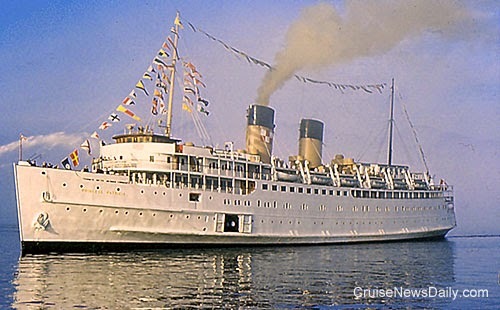 Princess Patricia was the first Princess ship, chartered from the Canadian Pacific Railroad, and it sailed a 14-day cruise to Mexico on December 3, 1965. The 50th anniversary of that important sailing is coming up, and Princess is going to have a fun way of commemorating it that Princess’ biggest fans won’t want to miss. CND subscribers also read about the greening of NCL ... an anniversary on QM2 ... and sharing the wealth. 22 April 2014 – Cunard Line is pleased to announce that in honour of the 10th anniversary of its flagship Queen Mary 2, the on board Canyon Ranch SpaClub® will introduce a selection of new spa and beauty services during the ship’s 2014 Transatlantic season. Canyon Ranch SpaClub – which includes the spa, beauty salon, wellness and fitness amenities – has been in operation since the ship’s first sailing in May 2004 and was the first outpost of Canyon Ranch SpaClub® at Sea division. At the center of the new offerings is the själ Skincare 10th Anniversary Diamond Lift Facial, which was specifically created for SpaClub. The integrative 50- or 80-minute facial, which features själ skincare's pure formulations, combines the perfect balance of skin refining and firming with the utmost in relaxation and luxury. The products used within the service contain potent levels of diamond, platinum, copper, nano-gold, sapphire and pearl for rejuvenation and luminosity. Crystal massage wands, gemstone stone therapy and micro-currents are masterfully utilized to enhance the benefits of these actives to promote circulation, tone and lift facial contours. Other additions to the spa menu this year include Lash Perfect semi-permanent eyelash extensions, Hi Brow Professional eyebrow services, La La Express individual eyelash extensions, and Megawhite Express laser teeth whitening. Ten favorite spa services from the last decade have also been bundled together to create the 10th Anniversary Spa Package, which includes any four listed treatments for a special price and includes a complimentary fifth service. At 20,000-square-feet, Canyon Ranch SpaClub aboard Queen Mary 2 is the largest spa afloat. Located on two decks, the spa facilities feature 24 massage, body and skincare treatment rooms, including two rooms for couples treatments, extensive weight-training and cardio center, coed relaxation lounge, beautifully appointed locker rooms and full-service Salon with dazzling wraparound ocean views. SpaClub also includes an Aqua Therapy Centre with a full range of rejuvenating aquathermal environments. In addition to the spa, salon and fitness services, SpaClub offers exercise and wellness, nutrition and personal training and Canyon Ranch’s award-winning spa cuisine is available at lunch and dinner in the Britannia Restaurant. Over the last decade, the SpaClub on Queen Mary 2 has consistently received top honors from various industry publications readers’ choice awards, such as Condé Nast Traveler and SpaFinder, Inc. Most recently, the SpaClub was named ‘Favorite Cruise Spa’ by American Spa magazine. Since becoming Cunard’s flagship on completion of her maiden Transatlantic Crossing in 2004, Queen Mary 2 has remained unchallenged as the world’s grandest ocean liner ever built and the most famous and fastest passenger ship in operation today. Her 2014 Transatlantic season kicks off in high style on 9 May from Southampton and 16 May in New York City and continues through November 2014. Canyon Ranch pioneered the evolution of the wellness lifestyle and has been an industry leader for close to 35 years. Operating the world’s most celebrated collection of life-enhancement properties, Canyon Ranch has destination health resorts in Tucson, Ariz., Lenox Mass., as well as Canyon Ranch Hotel & Spa in Miami Beach, the nation’s first luxury wellness hotel and residential community. In addition, Canyon Ranch operates a SpaClub at The Venetian & The Palazzo in Las Vegas, Nev., and SpaClub facilities on 19 ships that make up the Canyon Ranch SpaClub at Sea division. Canyon Ranch has been named the “Healthiest Spa in America” by Health magazine as well as the “Best Spa for Food” by Gourmet magazine. Additionally, Canyon Ranch is a 13-time winner of Travel + Leisure’s Best Spa Award and the only 11-time recipient of the Condé Nast Traveler Best Destination Spa Award. Carnival Corp declared a quarterly dividend of $0.25 per share, payable on June 13, 2014 to shareholders of record on May 23, 2014. The company operates 100 ships totaling 208,000 lower berths with eight new ships scheduled to be delivered between 2014 and 2016. These ships are operated by ten brands: Carnival Cruise Lines, Holland America Line, Princess Cruises, Seabourn, AIDA Cruises, Costa Cruises, Cunard, Ibero Cruises, P&O Cruises (Australia) and P&O Cruises (UK). The company also operates Holland America Princess Alaska Tours. MIAMI – April 22, 2014 – For more than four decades, Norwegian Cruise Line has committed to the protection of the oceans through sustainable environmental practices, investments in technology and a commitment to exceed regulatory requirements, fulfilling its core company value of Environmental Protection. On this Earth Day, Norwegian celebrates key achievements from the past year that, as a part of the company’s Eco-Smart Cruising program, help preserve the world’s oceans. Recycled 1,254 tons of cardboard, saving 23,540 mature trees. This represents enough saved timber resources to produce more than 292 million sheets of newspaper. Additionally recycled 2,517 tons of scrap metal; 2,988 tons of glass; and 669 tons of plastic, along with managing 750 tons of refuse at Waste-to-Energy facilities, conserving enough kilowatt hours to fulfill the monthly electric needs of more than 1,700 homes. 3,715 barrels of oil, which provides enough energy to heat and cool more than 772 homes for one month. Earlier this year, Norwegian Cruise Line established a partnership with The Guy Harvey Ocean Foundation, which funds inspired scientific research and innovative educational programs to encourage conservation and best management practices for sustainable marine environments. Famed marine life artist and champion of ocean conservation Guy Harvey designed the signature hull artwork for Norwegian’s newest ship, Norwegian Escape, which is set to debut in October 2015. Onboard Norwegian Escape, guest stateroom televisions will feature Guy Harvey Ocean Foundation-produced documentaries about endangered marine wildlife so that guests can be more educated on how they can help with ocean conservation. Norwegian Escape will also be the first new build in the cruise industry to feature innovative scrubber technology, to ensure the vessel is compliant with the 0.1% sulphur limit in Emission Control Areas (ECA) beginning in 2015. Norwegian Cruise Line established a partnership with NextEra™ Energy Resources®, North America’s largest producer of wind and solar power, in 2011. This partnership continues to provide Norwegian guests an opportunity to help build new renewable energy projects and offset their carbon footprint. This innovative program, a first within the cruise industry, is just one initiative amongst the many environmentally conscious efforts Norwegian is committed to through its award-winning Eco-Smart Cruising practices. Guests sailing on Norwegian Cruise Line are able to voluntarily contribute $10 per person, per cruise through NextEra Energy Resources’ EarthEra® Renewable Energy Trust via Norwegian’s website at www.ncl.com/environment. The EarthEra Renewable Energy Trust directs 100 percent of the funds received from Norwegian’s North American guests to build new renewable energy facilities across the United States. Norwegian also has a comprehensive program to educate its guests and encourage everyone to participate in environmental programs. Young cruisers who participate in Splash Academy and Entourage can learn about the importance of clean water through the innovative Officer Snook Water Pollution Program. They learn about the effects and prevention of marine pollution with activities that include a simulated beach cleanup and an environmental poster contest. High school students can earn between one and five hours of community service for participating in the program. Norwegian’s newest ships, Norwegian Breakaway and Norwegian Getaway, feature innovative and state-of-the-art environmental systems, including a second generation ballast water treatment system, innovative equipment to recover reusable fuel oil from waste fuel oil (thereby reducing the oil footprint), the use of the latest generation of silicon-based antifouling paint on the ship's hull to reduce friction, heat recovery and galley management systems to reduce energy consumption, as well as the latest generation of azipod propulsion units, smaller, more streamlined and much more efficient than the earlier versions. All of these features make these ships some of the most energy efficient cruise ships ever built. To further the company’s commitment to environmental stewardship, Norwegian Cruise Line will make a significant investment in the installation of 28 scrubbers on six ships in the line’s fleet: Norwegian Breakaway, Norwegian Dawn, Norwegian Jewel, Norwegian Gem, Norwegian Pearl and Norwegian Sun. The scrubbers will be installed starting this spring and installation will continue through 2016. Exhaust gas scrubbers were installed on Norwegian’s Pride of America, sailing the islands of Hawaii year-round, in 2013. Norwegian has implemented many of the most innovative policies and technologies in the cruise industry. As such, it meets or exceeds all international, US, State and local port regulations, including those set by MARPOL, the U.S. Coast Guard (USCG) and the U.S. Environmental Protection Agency (EPA). Norwegian is also accredited to the international ISO 14001 standard for Environmental Management Systems. This prestigious achievement recognizes that Norwegian utilizes a core set of standards for an effective environmental management system that reduces its environmental impact and increases its operating efﬁciency. Norwegian strives to process and land ashore nearly all solid waste materials produced aboard. The only solid waste discharged to sea is food waste, which is considered biodegradable and results in zero impact on the ocean environment. Every Norwegian ship is equipped with an advanced wastewater treatment system that treats all wastewater to standards rivaling that of the best shore side treatment plants. Norwegian Cruise Line has a shore side department devoted to environmental protection, and trained environmental officers sail on board every Norwegian ship. The Environmental Officers oversee all of the environmental operations and monitor their performance. All crew members receive initial and recurring training. The fleet is audited each year by a team of seasoned safety and environmental experts to ensure compliance to all company policies, as well as US and international regulations and standards. For more information on Norwegian Cruise Line’s environmental commitment, visit www.ncl.com/environment. Norwegian Cruise Line is the innovator in cruise travel with a 47-year history of breaking the boundaries of traditional cruising, most notably with the introduction of Freestyle Cruising which revolutionized the industry by giving guests more freedom and flexibility. Today, Norwegian invites guests to “Cruise Like a Norwegian” on one of 13 purpose-built Freestyle Cruising ships, providing guests the opportunity to enjoy a relaxed, resort style cruise vacation on some of the newest and most contemporary ships at sea. Recently, the line was named “Europe’s Leading Cruise Line” for the sixth consecutive year, as well as “Caribbean’s Leading Cruise Line” and “World’s Leading Large Ship Cruise Line” by the World Travel Awards. The Company recently took delivery of its most innovative ship to date, the 4,000-passenger Norwegian Getaway on January 10, 2014. Norwegian Getaway’s sister ship, Norwegian Breakaway, was named “Best New Ship of 2013” by the editors of Cruise Critic and “Best Rookie Cruise Ship” by the readers of Travel Weekly. Known as New York’s ship, Norwegian Breakaway is the largest vessel to homeport year-round in the city. The Company has two 4,200-passenger vessels on order at Meyer Werft: Norwegian Escape with delivery scheduled in the fall of 2015; and Norwegian Bliss with delivery in the spring of 2017. Princess Cruises today announced they would return to Japan for a third annual season in the summer of 2015, and they will again operate it with the refurbished Diamond Princess, complete with features customized for the Japanese source market. While the 2015 program will feature a four-month season with 20 sailings and some new short cruises to stimulate the market, it will represent a capacity reduction compared to this year’s program. But now the Lido Grill is undergoing a rebranding on all 15 HAL ships, and the menu is being upgraded, and the Grill will become even more popular. CND subscribers also read about Regal Princess returning from sea trials ... just in time for Earth Day ... Carnival Sunshine out to Sea ... and like magic in Papenburg. Carnival Corp reports they are on track to to reduce GHG emissions from shipboard operations by 20 percent before 2015. MIAMI, April 21, 2014 /PRNewswire/ -- In honor of Earth Day and the importance of year-round environmental awareness, Carnival Corporation & plc (NYSE/LSE: CCL; NYSE: CUK), the world's largest cruise company, today announced it will meet its goal to reduce its rate of greenhouse gas (GHG) emissions from shipboard operations by 20 percent. This goal was established by the company as part of Carnival's ongoing efforts to reduce environmental impact from its operations. To meet this goal, Carnival and its 10 brand lines around the world have developed, and continue to develop, aggressive energy reduction and conservation initiatives, many of which exceed current laws and regulations. "Carnival has made the amount of GHG emissions released an indicator of our environmental improvement, and we are focused every day on finding innovative ways to cut down on these emissions," said Jim Van Langen, vice president of management systems for Carnival Corporation. "Announcing that Carnival is well on its way to meeting this goal is a great way to celebrate Earth Day and all that it stands for. In fact, Carnival has already reduced its emissions by more than 19 percent since 2005 and we are likely to exceed our goal of 20 percent by 2015. This speaks to our commitment to constantly look for ways to raise the bar on environmental leadership and performance." As a part of its air emission reduction initiatives announced in September 2013, Carnival has pioneered an industry-first effort to develop ground-breaking exhaust gas cleaning technology that removes pollutants from the exhaust gases at any operating condition of a ship – at sea, during maneuvering and in port. Carnival is currently installing the systems in its fleet, representing a significant advancement in environmental technology and reduced air emissions. Continues to voluntarily install Advanced Waste Water Treatment Systems, and work on research and development for potential installations on new and existing ships. Almost half of the company's fleet (48 of 101 ships) has installed such systems. Installed vessel shore power systems – known as "cold ironing" – on 20 percent of the company's fleet to connect to a port's electrical grid, significantly reducing air emissions at ports that have shore power capabilities. In addition, several ships within Carnival's fleet have partial plug-in installations which can be retrofitted to full installation if they are deployed on an itinerary where the port has infrastructure and capacity for shore power connection. In 2013, fuel consumption decreased by more than five percent since 2007. An 18 percent increase in non-hazardous waste recycled from ships from 2011 to 2012. One hundred percent of Carnival's Operating Lines and ships are certified in accordance with ISO 14001, one of the world's leading environmental management system certifications. In addition, AIDA Cruises, one of Carnival's 10 brands, will operate the world's first cruise ships with the innovative Mitsubishi Air Lubrication Systems (MALS), which reduces drag and saves propulsion power. This system enables ships to glide on an air-bubble carpet, which is projected to save seven percent of the operating power. AIDA also recently teamed with Becker Marine Systems to develop a groundbreaking alternative concept – a Liquid Nitrogen Gas (LNG) hybrid barge – that is scheduled to be put into operation in Hamburg this year, reducing nitrogen oxide emissions by up to 80 percent and carbon dioxide emissions by 30 percent. "This new technology enables us to operate cruise ships with the lowest emissions and in the most eco-friendly manner to date," Van Langen said. "We are playing an important role in protecting the environment, improving the quality of air emissions and advancing technology for the industry." Carnival Corporation is a member of several global and national organizations driving environmental and sustainability efforts. These include the Global Environmental Management Initiative (GEMI), the Sustainable Shipping Initiative (SSI), the National Association for Environmental Management (NAEM) and the Marine Conservation Institute's (MCI) sustainable seafood program (in coordination with Holland America Line). In addition, the company actively participates in a number of environmental initiatives around the globe. In the United Kingdom, for instance, Carnival UK has created a partnership with the country's Science and Technology Facilities Council to launch an instrument on board Queen Mary 2 that monitors Sea Surface Temperature (SST). Carnival Cruise Lines and Holland America Line also have partnered with the University of Miami in a project with the International SeaKeepers Society. Carnival Corporation & plc is the largest cruise company in the world, with a portfolio of cruise brands in North America,Europe, Australia and Asia, comprised of Carnival Cruise Lines, Holland America Line, Princess Cruises, Seabourn, AIDA Cruises, Costa Cruises, Cunard, Ibero Cruises, P&O Cruises (Australia) and P&O Cruises (UK). Together, these brands operate 101 ships totaling 208,000 lower berths with eight new ships scheduled to be delivered between spring 2014 and fall 2016. Carnival Corporation & plc also operates Holland America Princess Alaska Tours, the leading tour company in Alaska and the Canadian Yukon. Traded on both the New York and London Stock Exchanges, Carnival Corporation & plc is the only group in the world to be included in both the S&P 500 and the FTSE 100 indices. 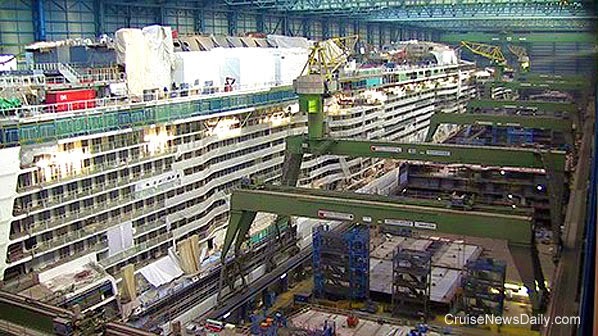 Construction is continuing on Royal Caribbean's Quantum of the Seas at Meyer Werft's Papenburg, Germany facility as shown in this construction photo taken late last week. The ship is being constructed inside one of the company's giant covered building docks, which has allowed construction to continue through the harsh winter of northern Germany. Meyer's order book is so full, the yard is working at capacity into 2017. The building large enough that it allows multiple vessels to be inside at once, and they are only floated out for approximately the last month before they leave the yard on sea trials. 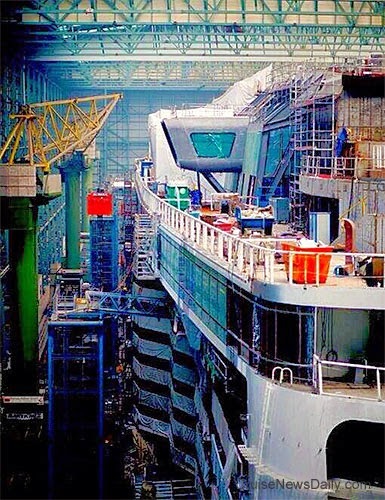 Looking down the side of Quantum of the Seas under construction at Meyer Werft. Photo courtesy of Royal Caribbean Cruises Ltd. All rights reserved. May not be copied or used without permission. 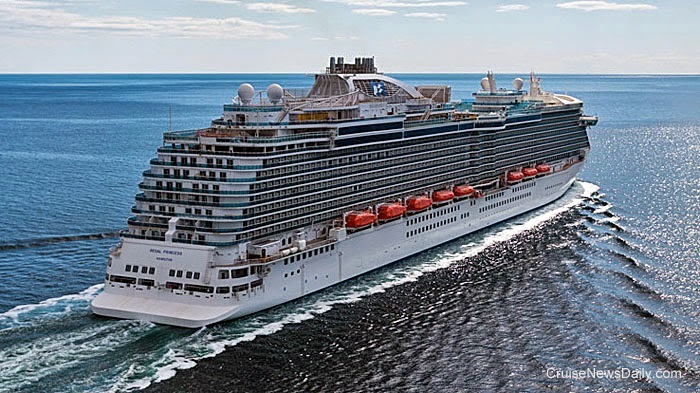 Princess Cruises said today they would return to the Japanese market for a third year in 2015 with Diamond Princess sailing a four-month season of 20 sailings from Yokohama and Kobe. The complete story will appear in the e-mail edition of Cruise News Daily. Holland America Line announced plans to rebrand the poolside grills on all 15 of their ships and upgrade the menus. The concept will be a gradual roll-out and once converted, the restaurant's name will become Dive-in at the Terrace Grill. Additional information will be in today's edition of Cruise News Daily. Photo courtesy of Holland America Line. All rights reserved. May not be copied or used without permission.